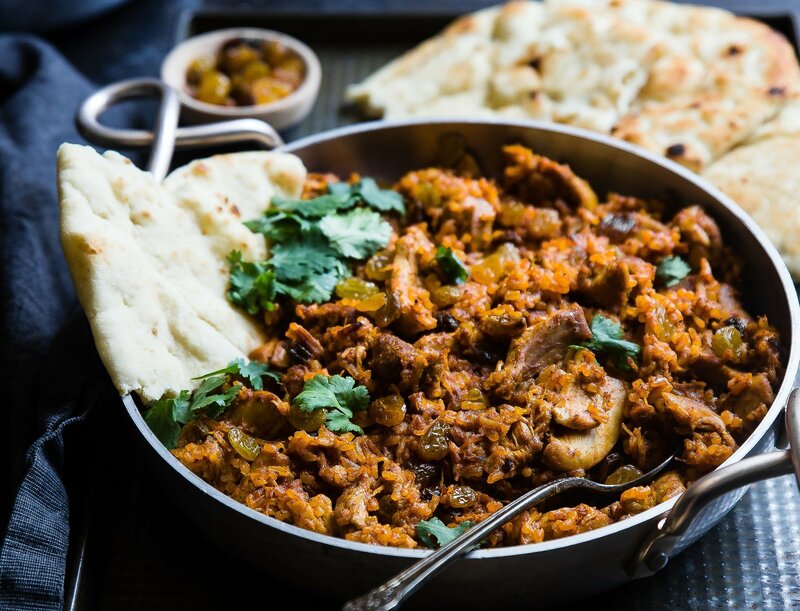 Lamb jalfrezi, chicken korma, mutton biryani… while the rest of the world was going vegan last month (a.k.a. ‘Veganuary’), there was a defiant outbreak of meat-based curry-making taking place chez moi. The spark for these culinary adventures was the lovely new rice cooker I got for Christmas. You see, up until now rice-making has always felt like a bit of a pain; too soft, too hard, a gelatinous gloop here and burnt pan there. Maybe it’s just me but, frankly, it put me off eating it more often. Now everything has changed. My new microwave rice cooker is a thing of beauty, quite literally, combining elegance, functionality and ease-of-use. There’s an idiot-proof measuring pot for the water and the rice, a table of specific cooking times, and it looks lovely, too – an all-in-one-pot, everything slotting together with a satisfying click. There’s even a bright red splash of colour from a clever rice paddle which doubles as a lock and evokes, from above, chopsticks laid across a bowl. And best of all… perfect, fluffy rice, every time. No fuss, no mess, no disappointed diners. I love it to bits, and others do, too, by all accounts, since a quick Google reveals that the maker has won multiple design awards. The App – there’s a capture tool I always mention in seminars that seems to evoke pleasure in people. Part of that is the joy of finally having a quick and easy way to get things off their mind, and this, I think, is mainly a result of its elegance and ease-of-use. One touch to start, one to finish, and that ‘open loop’ is in a place you can trust; your email inbox. Others are available, but here is someone who knows a thing or two about such matters to tell you its name. Great tool. The Calendar – unless you’re a master of the universe who employs people to remind you about stuff, then you have a calendar. Whether you love your calendar as much as someone I coached last month is another question entirely. We’d been discussing the calendar usage best practices of GTD and I started to mention the pros and cons of digital versus paper. The look on my client’s face signalled discomfort with the topic, and the reason, I discovered, lay close by. Their calendar lived in a much-loved Filofax. It had an embroidered cover, well-worn through usage, and tabs that were adorned with colourful doodles and stickers. Postcards and notes from loved ones peeked out the back from behind the calendar. The message could have been embroidered across the front in thread; “I’m not even going to think about using a digital calendar”. And this was fine. GTD is famously agnostic about which tools you use, but it’s clear where it stands on the importance of consistently using them to serve their purpose, so if it warms your heart to pick them up, all to the good. The Machine – I’d been wondering about the device on the desk all morning. It looked like a large card payment terminal with a keyboard on the front, but it seemed a little nosey to ask, right off the bat on day one of the coaching. But by late afternoon, we’d run up against a need to implement effective reference filing and all became clear. It was a label-maker. No, it was the Lamborghini of label makers. Always suggested in our pre-coaching blurb, but rarely actioned with this much class, it had fonts, effects, symbols. There was a smooth action as it printed out the adhesive label, and it made a crisp ‘click’ as you pressed a button to snip it off. The filing away of what had earlier been an amorphous pile of ‘stuff’ under the desk became a labour of love, so much so that when I returned the following day, all the filing had all been done, late into the previous evening, as if by the label fairies. I was smitten. I got home from the trip that night and went straight online to buy me one. Out in the next day’s trash went my hand-cranked label maker, and a new era of reference filing dawned. I don’t actually have much of a paper system, but a small makeover has taken place with what’s there and I’m looking for more. Perhaps that leftover curry needs to be labelled properly for the freezer. Having good tools helps. Do you love yours? Great message. Loved the analogy. So true – love your tools and you will want to keep coming back. For paper reference filling, I just love manila folders. Didn’t know about them until I took the L1 TTT. Completely uncommon in Germany, Germans do love their typical Leitz folders. It’s just such a waste of time and energy to use those. Indeed. Those Lever Arch contraptions are like little man-traps for your fingers, too! Oh Miles, your writing does make me smile and how you related back to GTD methods is very clever. I’ll be an Amazon soon to buy me a rice cooker and Ferrari label maker.